Andrew James Hoover sent this one in. 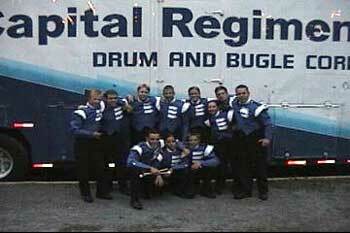 "This is a picture of the 2003 Capital Regiment pit after the Eastern Classic in Allentown, Pa. We practiced at J. Birney Crum stadium leading up to the competition, so we got to push our equipment up and down that little hill to the stadium several times. Our four- wheeler's transmission will never be the same." Thanks Andrew!